At the moment when we start a performance, I always feel part of a team: my own section of the choir of course, but also a greater sense of belonging to a large, chaotic, talented family. Then there’s the thrilling exhilaration of the music, when you have to try to focus and not get carried away by the soaring sopranos, or the chocolatey bass tones, or a line of music you just particularly love. I’m always exhausted at the end of a concert, but where else do you get a chance to do something such fun with fifty other people?! 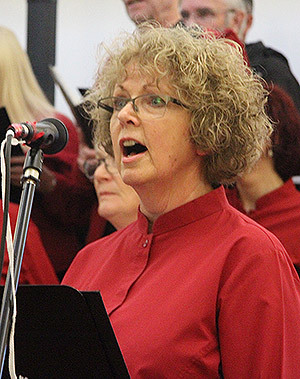 I joined the Fishpond Choir in 2001, a couple of months after it was founded. I hadn’t been in a choir since I was at school but the other members made me feel at home straight away. In the early days it was a rough and ready affair, not much more than a sing song on a Monday night but when Dana took over as MD it was like a singing master class. My singing improved, so much, even to the extent that I am now let loose on the odd solo. The choir has brought me so much enjoyment. Some times it feels like another family. At half time in a prestigious charity concert a member of the audience thanked me for “giving up my Saturday evening to help the cause”. After some thought I told her that there was nothing I would rather be doing.